"Ladies! Do you spend hours in front of your closet, endlessly searching for something to wear? I am so sick of all my clothes, but happen to love my friends' tastes. Wouldn't it be fun to dig through each others closets? So..... let's trade! and let's have a glass of wine while we sift through stacks of clothes!" - well i haven't, but i can say this dress has spent time in barbados! 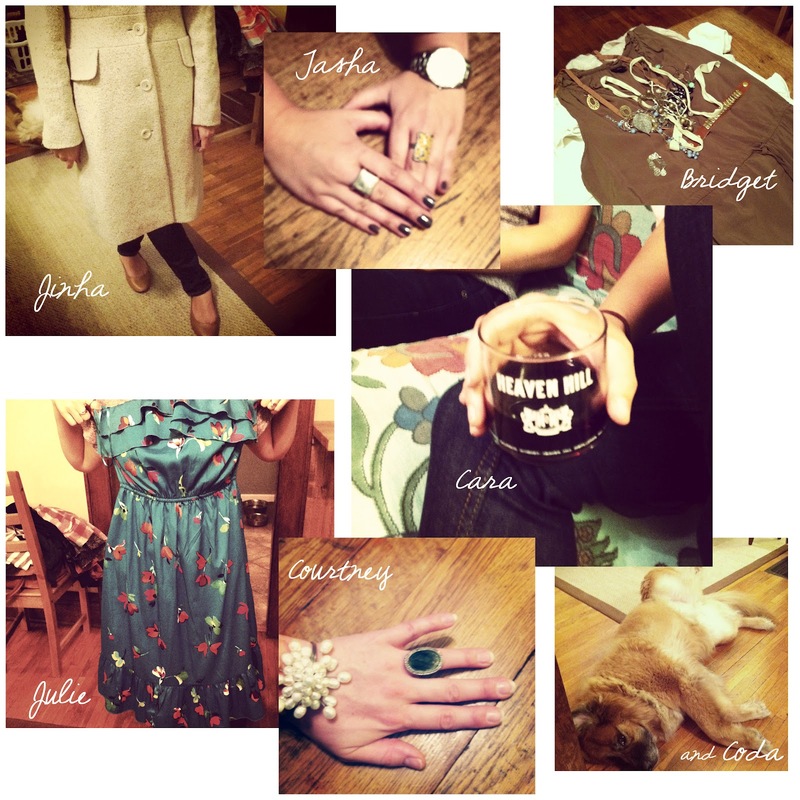 - gorgeous rings, bracelet, and two bottom sweaters courtesy of cara. she ran upstairs and pulled the other one from her closet. like me she often buys things in doubles - so sweet of you cara. - and this bottom tunic i got from courtney, ironically i gave it to her three years ago. before i got there she bet the other girls i would like it and not realize it was ever mine. carry baggage with it that you suddenly want to purge from your life. it now feels new to me again. thanks girls for all the wonderful pieces and a great night! screaming three-year old off me who was pulling some amazing line-backer like moves. cole will have to do a lot better if he wants to catch up to Liv's tantrums....ha!